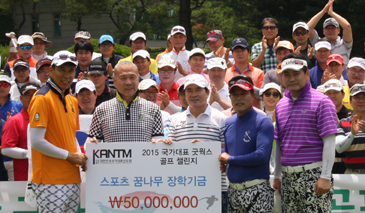 KANTM Chairman Jang Yoon-Chang (left) poses with other key participants at "2015 Sports Stars' Good Works Golf Challenge" held at "Green Hill CC" in Gwangju, Gyeonggi Province on June 29, 2015. At right is Vice Chariman Yang Jong-Ock. On June 29, 2015 scores of South Korea's famous senior athletes gathered at a local golf course "Green Hill CC" in Gwangju, Gyeonggi Province for a friendly and charity golf tournament. Among them were South Korea's most famous marathoner Lee Bong-Ju, nation's professional wrestling star Lee Wang-Pyo, and judo star Yang Jong-Ock. Lee Bong-Ju was the silver medalist of the 1996 Atlanta Summer Olympics. The golf tournament was hosted by volleyball star Jang Yoon-Chang, chairman of the Korea Association of National Team Members (KANTM). Yang serves as its vice chairman. The middle-aged sport stars once represented South Korea in various sectors of the sports. "Libellula" CEO Lee Jong-Hwan (right) poses with Lee Bong-Ju, S. Korea's star marathoner at "Green Hill CC." "2015 Sports Stars' Good Works Golf Challenge" is the official name of the annual golf event, which produced a fund of 50 million won for donation. What is unique about this golf tournament is that the sports stars were all wearing golf brand of a local golf wear maker "libellula" made by Lee Jong-Hwan, CEO and president of a local golf wear manufacturer "FM Global." FM Global's "libellula" was the official sponsor of the charity golf event. It sponsors a number of other sport events as well. The up and rising local golf brand is gaining huge popularity for its colorful design among the nation's sports stars. Earlier on May 14-17, 2015 some golf players were also wearing FM Global's "libellula" products at 34th GS Caltex Maekyung Open Golf Championship held at Nam Seoul Country Club in Seongnam City east of Seoul. A number of other manufacturers of South Korea's golf wear went to the venue of the golf event to seek media's attention for their golf brand. But, it was FM Global's "libellula" that drew a special attention from the local media and the experts of golf industry during the four-day golf championship. 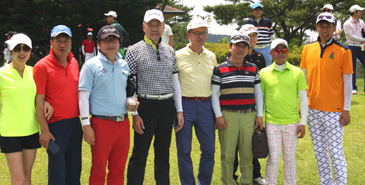 KANTM Chairman Jang Yoon-Chang (right) poses with others at "2015 Sports Stars' Good Works Golf Challenge" held at "Green Hill CC" in Gwangju, Gyeonggi Province on June 29, 2015. For "Maekyung Open" the event "libellula" CEO chose two professional golf players, Song Ho-Uk and Lee Ju-Young, for the promotion of his golf brand "libellula." "I am pretty sure that more people will choose to wear our products because our colorful desgin is targeted at younger generation," "libellula" CEO said. An enthusiast for golf himself, Lee loves rubbing shouders with golf stars and with other sports stars officially and unofficially. Lee jumped into the golf wear industry some 10 years ago as the golf was becoming more and more popular among the local Koreans. Lee points out that the number of South Koreans enjoying golf has dramatically increased in the recent two decades or so. "The number doubled to over 5 million from 2.5 million over the last 10 years alone," Lee says. "Even more South Koreans are expected to enjoy golf in years ahead"
"Libellula" CEO Lee Jong-Hwan (center) poses with KANTM Jang Chairman Yoon-Chang (right) and with other participants. Lee says that he designs golf wear himself with the assistance of experts, and chooses high-quality functional fabrics to produce the top-quality golf wear products. Presently, he produces some 40 different kinds of T-shirts, pants, belts, and caps with his employees directly from his factory in Seoul. "Most South Korean manufacturers of golf wear produce their goods in such countries as Vietnam, China, and Indonesia," Lee says. "But our products are produced all here in Korea"
Lee describes his brand "colorful, unique, and young," targeted at younger generation of golf lovers. With the help of a professional namer Lee created his own brand "libellula," meaning dragon fly in Italian a couple of years ago. "I hope that both local Koreans or foreigners can wear our brands and enjoy golf," Lee adds. "I will keep enjoying golf game and keep making golf wear"